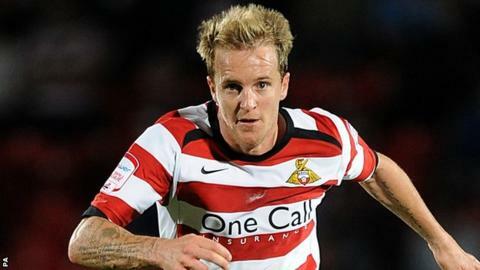 Doncaster cemented their position at the top of League One at the expense of resurgent Hartlepool. Lowly Pools, who came into the game seven unbeaten, began the match strongly, but fell behind when Rovers forward Iain Hume drilled home. James Coppinger made it 2-0 by tucking away his first of the season, before Steve Howard had a fine chance to pull one back, but headed against the post. Billy Paynter ensured the Rovers win, heading home James Husband's cross. After taking advantage of a Hartlepool side bereft of ideas, Doncaster remain one point clear of Sheffield United at the top of the league. The visitors, who are now eight points away from League One safety, also had keeper Scott Flinders to thank for keeping the scoreline respectable, as he made fine saves from David Cotterill and Jamie McCombe. "We were excellent. First half they made it difficult for us to play to the pattern we'd like to play. "We needed something bright and inventive and Iain Hume gave us that. "We highlighted certain things at half-time that we needed to improve on and they did that. It was a really good professional 45 minutes in the second half. "We look like a team that's enjoying its football, with a smile on its face and when you've got that, you've got a real good chance of getting good results."